You can forget bully beef and carrots as Chef and sommelier duo Vicky Leigh Smith and Shaun Collins from the British Army Culinary Arts Team brought home the prize for Best Food & Sweet Sherry matching at this years’ International Copa Jerez in Southern Spain. 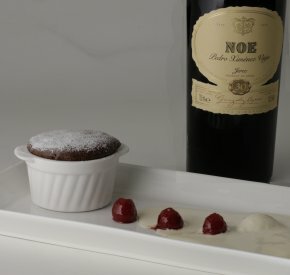 The pair designed a chocolate soufflé with glazed raspberries, chilled cream and sloe gin ripple which they paired with a 30 year PX, going on to defeat chefs from the USA, Denmark and Germany. The UK team lost out to Dutch duo Jarno Eggen and Cindy Borger, from Restaurant de Lindenhof, who were eventually awarded the title for overall Best Menu. It was said to be a very close call with a judging panel that included Juli Soler, co-owner of El Bulli, and renowned Japanese Sommelier Kazuyoshi Kogai. Now in its third year, International Copa Jerez is part of The Sherry Institute of Spain’s ongoing campaign. Lots from some of the most prestigious names in the wine world will go under the hammer at a charity auction at Berry Bros. & Rudd with an estimated value of almost £60,000.A unique collection of top Bordeaux wines from the legendary 2005 vintage, a private wine tasting with Jancis Robinson MW and an exclusive tour of some of the top Chateaux are among the auction lots which will raise money at Berrys’ Big Red Nose Day Dinner on Friday 13th March 2009.Highlight include fifteen imperials from the 2005 vintage donated by chateaux including Latour, Margaux, Cos d’Estournel and Angélus, a duo of Balthazars of 2005 Haut-Brion and 2005 la Mission Haut-Brion and a First Growth Dinner in Berry Bros. & Rudd’s Directors Dining Room for six people. Help to make 2009 a record-breaking year for Wine Relief by placing a bid at the auction or just donating at www.rednoseday.com/winerelief. The Royal Agricultural College at Cirencester has run a Wine MBA course since 2001. They have a Postgraduate Open Day coming up on Saturday 28th March for those wishing to start the course in October, so if you would like to know more, you can register to attend at http://www.rac.ac.uk/?_id=3649. The MBA in Wine Business Management consists of a number of different modules dealing with business elements such as Strategy and Finance as well as focus modules looking at the wine industry, viticulture and vinification and wine business planning. In addition there is a study tour arranged to a European wine growing area during the Easter holidays and the 25,000 word dissertation is on a wine business topic of the student’s choice. For centuries the Auld Alliance between Scotland and France has been strong but could this be about to change over a bottle of Bordeaux? In one corner we have Chris James, owner of Torosay Castle and Gardens on the Isle of Mull. In the other we have Mr Bernard Magrez, owner of the Château La Tour de Carnet estate in Bordeaux. The bottle in question is a Bordeaux dating from 1893 and is in perfect condition. Chris has uncovered the bottle in a sideboard which had been locked for over 100 years and is keen to hang onto his find, but M. Magrez is reportedly keen to have it back. Chris had always been intrigued by the contents of the dining room sideboard, as the key had never been in his family’s possession. His curiosity finally got the better of him and he employed a specialist locksmith to have a key cut in an attempt to bring the family mystery to a conclusion. On opening the door it was clear that this was the first time that the cupboard had seen the light of day since 1897 – Chris had unearthed the original castle owner’s personal drinks cabinet including brandy, port, a bottle of Veuve-Clicquot and the bottle of La Tour de Carnet. The Bordeaux originates from Mr Magrez’ Château in the Medoc region and is in mint condition having been kept in the dark all these years. Mr Bernard Magrez, owner of the Château La Tour Carnet and Château Pape Clement vineyards, would like to exhibit this historic vintage in his château but Chris is reluctant to let this piece of history leave Torosay Castle. He has extended an invitation to Mr Magrez to visit him on Mull and see the bottle in person, which Mr Magrez has accepted. Perhaps Mr Magrez will be able to persuade Chris to part with the bottle. …but sales don’t. Previously unreleased survey data from 1,064 UK regular wine drinkers released by Wine Intelligence shows a significant increase in the number of UK regular wine drinkers aware of Organic, Fair Trade and Biodynamic wines. According to the consumer research findings 71% of regular wine consumers in the UK are now aware of Fair Trade wines, up from 65% in April 2008. However, whilst awareness has continued to rise, there has been no significant change in the number actually buying Fair Trade wines – and 6% of those aware of Fair Trade wine stated that they were buying less Fair Trade wine than they used to due to the economic downturn.